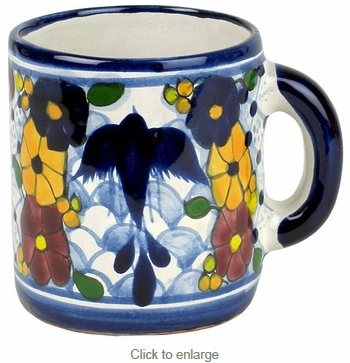 A Talavera coffee mug is a bright way to start your day and will look great in your southwest themed kitchen. Our Talavera dishware and serving pieces are lead-free and safe for serving food and using as dinnerware. Talavera is dishwasher and oven safe. All of our Mexican Talavera is handmade and hand painted by Mexico's talented potters.